Cortona is an appealing historic town perched on a steep hill in Tuscany, with views over both Tuscany and Umbria. Cortona is located in the central Italian region of Tuscany (Toscana), in the Province of Arezzo. The town isn't far from the border with Umbria, and its magnificent views extend over the green plains and hills of Tuscany and Umbria, extending beyond the lovely Lake Trasimeno. Cortona is a pleasant day-trip destination for tourists exploring Tuscany, and it's appealing enough to use as a base for a more relaxing holiday. The town is attractive and welcoming, with several inviting bars and restaurants off the central piazzas, and a few highly-recommended places to stay. Cortona is surrounded by defensive walls, the foundations of which date back to the Etruscan period. Tightly-clustered medieval houses pack the slopes, leading upwards to an open green area where the hill is crowned by a Medici fortress (the Fortezza Medicea). The narrow lanes and alleys winding up and down the slopes within Cortona can be confusing; it's a good idea to arm yourself with a street plan before exploring. Just below the fortress is a large church; the Santuario di Santa Margherita (Sanctuary of St. Margaret). The church, which was rebuilt in the nineteenth-century, is not particularly interesting, although it does contain the remains of the local saint. A bar next door provides welcome refreshments to travellers who have ascended the pleasant leafy path up from the town centre; a climb which can be draining in the summer heat. One of the finest sights in Cortona is the Annunciation by Fra Angelico (Beato Angelico), in the Museo Diocesano. Other treasures in the small museum include works by Cortona-born Luca Signorelli and by Pietro Lorenzetti. A wide range of local artefacts from various eras can be admired in the Museo dell'Accademia Etrusca, where the prize exhibit is a bronze chandelier dating to the 5th century BC. 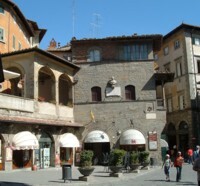 The museum is housed in the 13th-century Palazzo Casali, the grandest building in Cortona. Churches worth visiting include the pretty fifteenth-century Chiesa di San Niccolo, a small Romanesque church containing a painting by Signorelli, and Madonna (or Santa Maria) del Calcinaio (1485), a domed Renaissance church located outside the walls. At a few kilometres' distance, the Franciscan monastery of Le Celle dates back to the thirteenth-century and is connected with various saints including Francis and Anthony. Cortona is on a slow railway line between Florence and Rome, and is served by trains from both cities. The railway station is called Camucia-Cortona, and is located at the foot of the hill on which Cortona is sited. Buses run from the railway station up to Piazza Garibaldi, by the city walls; tickets can be bought at the adjacent bar. If you just miss a bus at the station, more frequent services pass by the crossroads a short distance uphill. If you are travelling from a nearby town, like Arezzo, you may find it more convenient to take a bus between the towns. One of the best-selling books about Italy in recent years, Under the Tuscan Sun is set in Cortona, and became a new tourist attraction for the town. A whimsical personal account, it gives little insight into local society or people, but is strong on atmosphere and cuisine. American Frances Mayes bought a holiday home here with her partner and, amid much philosophical musing, renovated the property and cooked a lot of meals. Many people have enjoyed this portrayal of the good life; a film was based loosely on the book, and the local tourist board began to capitalise on the association. It's not one of my favourite books about Italy, but it's certainly of interest if you plan to visit this area. 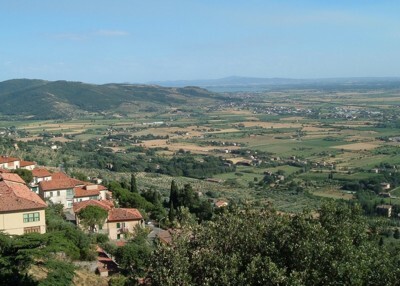 There's a good range of accommodation options in and around Cortona. These include quirky little B&Bs, historic palaces converted into classy hotels, private apartments for a more independent stay, and countryside villas and farmhouse agriturismi. The four-star Hotel Villa Marsili offers elegant accommodation in an eighteenth-century villa just outside the centre of town. Right in the historic heart there are a number of B&Bs and holiday apartments, such as the B&B La Corte di Ambra, and the apartments of Appartamenti Belvedere. In a countryside setting nearby, the many excellent accommodation options include Cortona Resort Le Terre dei Cavalieri, a good choice for a rural stay with a swimming pool and countryside views; a good base for relaxing and for exploring the area by car.